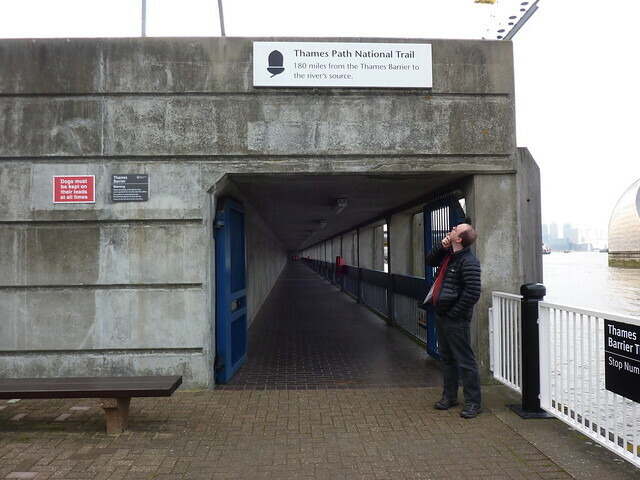 In many ways, the Thames Barrier is a curious place for the eastern end of the Thames Path National Trail. It makes no real sense. The western end is obvious, being at the source of the river as it makes its 215 mile journey from the Cotswolds towards the sea, but ending the trail at the Thames Barrier, well that is less so. The River Thames itself still has another thirty miles to go until it reaches the estuary at Canvey Island. So why does the Thames Path National Trail start, or end, at the Barrier? Every now and then there’s talk of extending the Thames Path all the way to the estuary; of connecting up a myriad of existing rights of ways down the river and allowing the walker to connect source and sea together. Indeed, there’s already an official yet unofficial 13 mile extension from the barrier down through Woolwich and on to Crayford Ness. It’s official in that it appears on signposts named as the “Thames Path”, but unofficial in that it’s not formally part of the National Trail itself, and has its own logo of a Thames Barge rather than the standard acorn. But for now the idea of extending the route all the way to the sea is just that: an idea. The official trailhead stands firmly at the Thames Barrier, and that’s not changing anytime soon. On the other hand, the Thames Barrier is perhaps one of the most majestic structures on the Thames, and is certainly a sight to behold. With its row of piers, each topped with a large metallic shell shaped construction which gleams and glistens in the sun, the Thames Barrier looks like something out of the future. The addition on each of the nine piers of a bright yellow crane-like contraption, adds to the whole mystique, making the whole caboodle look almost unreal. Spanning the third of a mile width of the Thames and completed in 1982 after eight years of building work, the barrier is the second largest movable flood barrier in the world. Only the Oosterscheldekering barrier in the Netherlands beats it, with the movable section of that barrier coming in at two and a half miles long. Naturally this all means that behind the Thames Barrier’s shiny façade is some serious power; the power required to hold back huge amounts of water. Yet, standing on the banks of the Thames looking out at it, that power is mostly hidden. 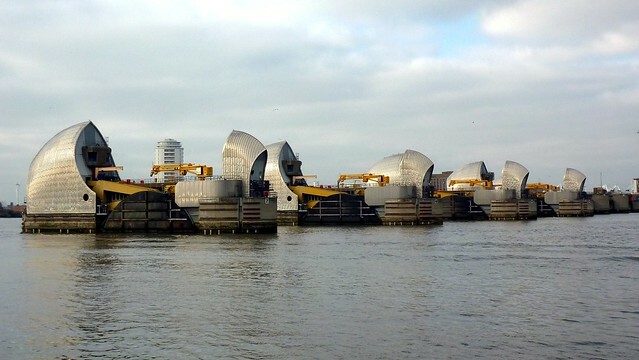 The barrier gates spend most of their time resting on the bed of the Thames, only coming into view when circumstances, or routine maintenance, requires them to be raised. Whilst an individual gate can be brought up to the closed position in around fifteen minutes, it’s not actually possible to close the whole thing so quickly; to do so would risk a massive tidal wave hitting the capital which, for some reason, those in charge don’t think is a particularly good idea. In fact it takes many hours before the gates can be raised safely. Shutting the gates is a slow process with many steps. Shipping needs to be alerted and secondary defences along the river activated first; the Barking Barrier, the Dartford Barrier and the Tilbury Dock Gates to name just a few. Only once every step on the ticklist has been checked off can the barrier be safely closed. When all is said and done, the Thames Barrier doesn’t look like something designed in the 1970s. The 70s is, after all, a decade best known for geometric shaped skyscrapers and brutalist architecture, and one where concrete reigned supreme. Indeed when the barrier was being designed, it must have felt to some that it would look incredibly out of place. With its sleek curved metal, and bright yellow cranes, it must have looked like a shining beacon from the distant future; revolutionary in fact. Either that or just plain weird. Now, all those years on, the Thames Barrier seems to fit in more neatly with the 1990s; maybe even early 21st century. In terms of style, it was ahead of its time and doesn’t seem to have aged one bit. I stood at the barrier, trying to show Sam this, although at three months old, his vision wasn’t particularly good. No doubt he could make out some strange grey blobs in the distance, but to be honest he seemed far more interested in squinting at the small fluffy red elephant attached to his pram. The Thames Path sets off from a simple sign next to the barrier and above a subway tunnel. 180 miles to the source, it says. Come on, what are you playing at? Time to get walking, it might as well add. The subway takes it all a bit more seriously, showing a map of the river and all the places that those who follow it could visit. 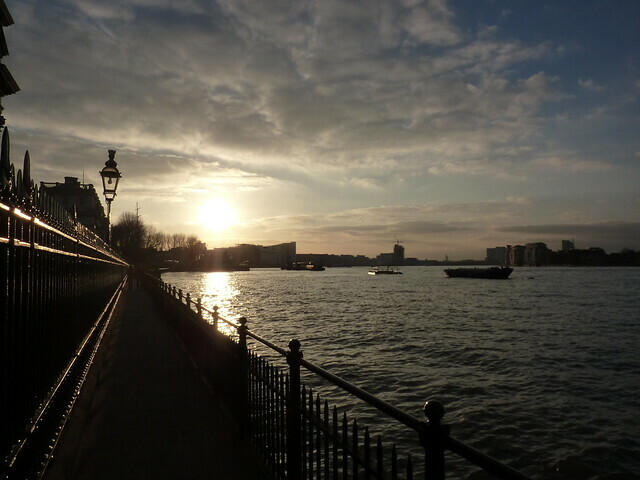 The first few paces on the trail are a reminder, should the walker ever need one, that the Thames is a working river. On the other bank, the mighty Tate and Lyle refinery stands; opened in 1876, the massive site specialised in sugar cube production and sugar refining continues here to this day, even if it’s no longer owned by Tate and Lyle themselves. It’s the Americans who own it now after Tate and Lyle sold off their refining business in 2011. On the south side, things weren’t quite so sweet. Aggregate recycling is the principal business here, with huge piles of rock and rubble piled up waiting to be sorted before being taken away by ship. Some of it still travels by river from nearby Peartree Wharf; peering through a fence I noted that one barge was busily being filled up as we walked by. It’s a story that is repeated throughout the river in London: one time undesirable land, tarted up for those with lots of cash. Whilst warehouses and wharves once filled the banks of the river, now huge swathes of it is taken up by residential properties. Hosting luxury apartments with riverside views, the so-called Greenwich Peninsula, with its fine views of Canary Wharf, City Airport and a sugar refinery, offers plenty of options for those that can afford the premium prices. Every few years someone erects some more apartment blocks, allowing more people to spend their hard earned cash for their spot near the water. Yet as we walked on, it was noticeable how the river was also an obstacle too. It was only a short hop to the north bank in terms of distance, but those wanting to cross the river would face a significant detour. For years the nearest crossing was the busy Woolwich Ferry a few miles away. Only in 1999 did the tube arrive, with the Jubilee Line connecting Canary Wharf with the new Millennium Dome, which loomed up ahead from us. 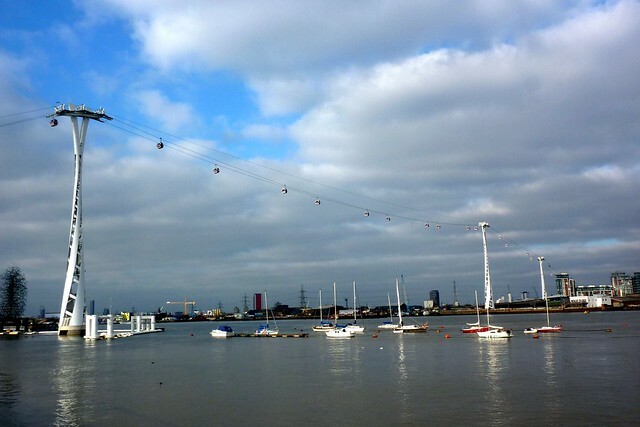 However in 2012 another option arrived in the form of a giant cable car spanning the Thames. Mockingly nicknamed the Arabfly Dangleway by one prominent London blogger, and routinely derided by both the press and Londoners alike, the Emirates Airline has a capacity to transport 2,500 people an hour, yet as we walked past in spring 2013 its ridership was a mere 4,500 people a day. 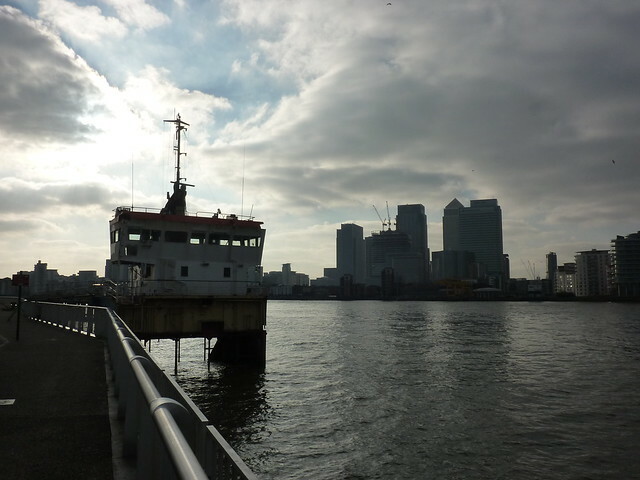 Recent headlines in the local press had screamed that the system had just a handful of regular passengers and it was mostly being used by tourists wanting a view of the river and nearby Canary Wharf. Initial proposals claimed the system would be built entirely through private finance, but in the end the taxpayers of London had to stump up half the cost. Like many I’d always seen it as a massive white elephant, created by Mayor Boris Johnson who seems obsessed by high profile projects with limited value. But despite my views on its worth, there’s no denying that the Dangleway is a mighty and imposing sight on the Thames. Spanning a 1km distance, its three pylons tower over the river; the tiny cars moving over the water at a height of 90m. I’d never ridden it, and had no need to today given the Thames Path stuck distinctly to the south side of the river, but as the sun came out and glistened on the river, it was, for a moment, tempting. We could shell out a few pounds and make those passenger totals up to 4,503, no problem. Just how do you do a walk with a three month old baby? It was a question we’d pondered before setting out. The paved nature of the London stretches of the Thames Path had certainly given us options, and our first trip out proved to be a time for experimentation. We’d taken no chances, providing young Sam with the option of moving in a baby carrier, a baby wrap carrier or a pram. As we approached the Dome, now long renamed The O2 Arena, he was travelling in his pram, fussing around and making a lot of noise. So much so that the entire of the Greenwich Peninsula could hear his screams. It had been a while since he’d been fed so we wandered up the riverside path looking for a bench, eventually finding one at the rear of the Dome, next to the odd sight of a cross section of an old ship, moored in the river. As Sam fed happily, I took the opportunity to admire this strange monument. The cut up ship is a piece of art called “Slice of Reality”. The artist took an old ocean-going sand dredger, and carved a vertical slice from it, focused around the habitable sections of the ship. About 85% of the ship was discarded, leaving the poop deck, bridge and engine room moored up on the Thames. Part of it has been screened off, creating an inside room encased in clear perspex, and as Sam powered up we sat and watched as people played on the pool table inside. Slice of Reality was created and installed for the Millennium Dome, along with a number of other art works dotted around the local area. When the Dome closed up, all the art was supposed to be removed, and most was. However the Slice of Reality remained after artist Richard Wilson pointed out that it wasn’t on the Dome’s land and that therefore they had no rights to insist on it being removed. Clearly the stubborn type, he arranged for an extended mooring license and his bit of cut up ship has remained on the river ever since. The slightly rusting remains of the old sand dredger stood in sharp contrast to the shining, nay gleaming, backdrop of Canary Wharf on the other side of the river, but even that mighty complex of glass and metal was about to be upstaged. Slowly manoeuvring up the river was far more interesting sight; HMS Lancaster. As we sat on our bench (and Sam slurped some more) it got closer and closer, brought into position by two tugs who were taking it up to West India Quay. Its grey paintwork seemed to almost merge into the backdrop of a cloudy sky and the grey metal of the business district. It wasn’t hard to picture why the boat had been painted as it had. On first glance it didn’t feel like grey would be the right colour for naval camouflage, but there was no mistaking that it worked perfectly. The Dome sits at the top of the Greenwich Peninsula. From here the Thames double backs on itself, meaning the Thames Path walker comes close to walking a full circle all the way round the Arena. It’s possible to take a shortcut of course; lop the walk off by heading through the Arena grounds, perhaps stopping off for a burger or coffee inside. The true Thames Path walker stands resolute against such temptations. The true walker continues to walk on the river bank, just as the Thames Path’s creators intended. And they continue to follow it all the way down to Greenwich. Well unless they find a big sign telling you that the footpath is closed. As we rounded the large white tent, we suddenly found that the proper route from the Dome was blocked off, hidden behind a large metal fence, with a terse yellow sign informing us about “Thames Path Repairs and Improvements.” For a mile and a half or so, the riverside route was shut. Indeed, not even shut: it didn’t exist. 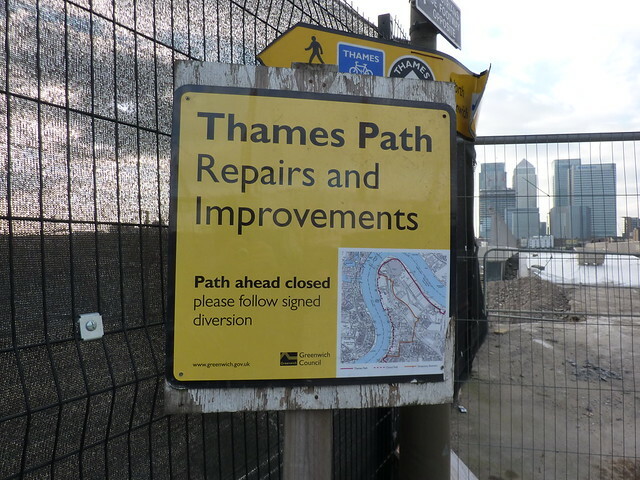 It wasn’t the Thames Path that was being repaired or improved. In fact the whole area had become a massive building site. Nothing of what was there previously seemed to remain. There was just mud and rubble, and that meant that the riverside path was gone too. A small map on the yellow sign gave us instructions of what to do instead. Go inland and follow the Thames Cycle Path seemed to be about the gist of it. So that’s what we did, leaving the water glimmering and glistening in the sun whilst we headed past a bus station and down a near-empty dual carriageway named, inevitably, Millennium Way. The road took us past empty land and car parks offering parking for Arena events at the bargain price of £28 for the evening. The resulting traffic jam when everyone all tried to leave at once, well that’s free. Sam bounced up and down merrily in his baby carrier as his empty pram was pushed down the road. His head spun from side to side rapidly, doing his best to see everything he possibly could, even if there wasn’t much to see besides massive car parks and wasteland, waiting for redevelopment. Yet for all the emptiness of Millennium Way, this was no quiet area. Off in the background cars queued up to cross under the river in the Blackwall Tunnel. It’s a key crossing for those wishing to get to the other side of the river; the last for 16 miles until Dartford with only the Woolwich Free Ferry in between. At the end of Millennium Way sat a giant roundabout that seemed to do its best to ensure that pedestrians didn’t cross quickly, before the Thames Path’s diversion led us down another road. Blackwall Lane was distinctly busier with buses and lorries thundering along. This was certainly not going to be the Thames Path’s finest hour. With the river well hidden behind urban sprawl there was little of interest to look at. Just rows of houses and shops. Oh and a small sign outside a modest and modern looking industrial unit. 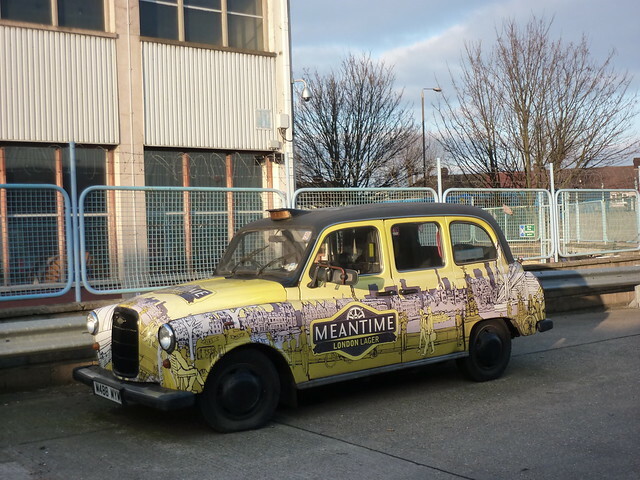 “The Meantime Brewing Company. Brewery shop open, brewery tours available!” My eyes lit up. “We could pop in,” noted Catherine casually. “Remember when we used to drink their Chocolate Porter and eat Battenberg?” was the only obvious response. Fifteen minutes later we left again; the basket under the pram now groaning under the weight of several bottles of beer. Well prams have to have their uses, and Sam had not been particularly keen on spending time in it that day. And who could blame him. What can a three month old baby see from a pram? Nothing but the sky and the tops of lamp posts. Much better to be carried and be able to see all the delights of London. And the odd brewery too. The sun was getting low as we arrived back on the riverside path. Off in the distance, the dome of the O2 shone brightly in the early evening sun. Outside the Cutty Sark pub, a giant anchor stood, although the many paragraphs of explanatory text which explained just why there was a giant anchor there, were in an awkward position and especially difficult to read when you have a baby strapped to your chest and the sun’s shining in your eyes. Only later did I find out that it was a sculpture by artist Wendy Taylor, and that the inscription gave a brief history of East Greenwich. The Cutty Sark pub was pulling in the punters, as was the Trafalgar Tavern next to the Royal Naval College. The Trafalgar had a long and distinguished career, gaining fame as a meeting place for politicians in the 19th century, who would enjoy a whitebait supper there, washed down with plenty of ale no doubt. Now it attracts visitors from across the globe, as demonstrated by a long line of Japanese tourists who were making their way through the front door. I’ve always loved the centre of Greenwich with its quaint foibles and historic buildings. It may be a massive tourist attraction of a town, but it’s a particularly pleasant one. Not surprisingly the place was bustling as we walked the short distance along the Thames Path to the Cutty Sark itself, standing tall and proud. 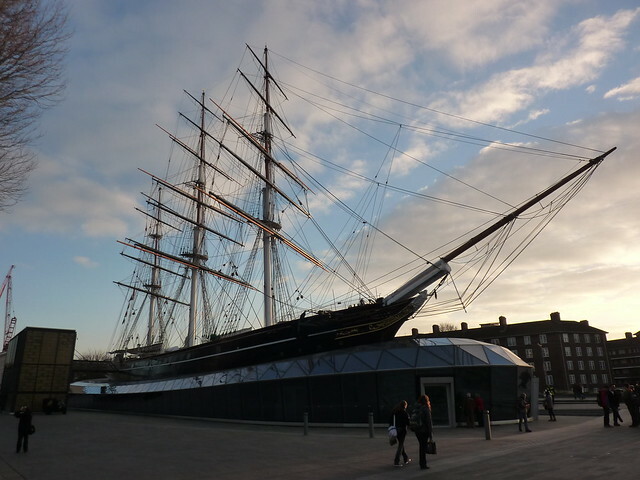 Built in 1869, the former clipper ship had once travelled the world carrying cargoes of tea to its mother country, before becoming a tourist attraction in Greenwich in the 1950s. It had recently undergone restoration, a process lengthened by a dramatic fire on the site in the 2007. Now re-opened for business once more, it was proving to be the tourist draw that it ever was, and we quietly battled our way through the throngs of visitors waving their cameras and generally enjoying themselves. Evenings though aren’t a time for babies. They tend to get in the way of your social life, what with their needing food and an early night. Still with Sam sleeping happily in the baby carrier (the pram still being used for the transportation of beer) we headed inland for a quick pint. And where better than a pub owned by the same brewery we’d visited earlier in the day. Tucked up a side street near the railway station we popped in to the packed Greenwich Union and toasted our success. Our first day on the Thames Path was complete. We’d made it, baby and all. On the train home, Sam celebrated too. His celebration technique being just a bit different, coming in the form of a massive screaming fit. Well, each to their own. A couple of weeks after our walk in March 2013, the section between the Dome and Greenwich along the riverside re-opened. Diamond Geezer was there. Next time: tourists, famous bridges, tourists, famous buildings and tourists. Hi Jo – I used the maps in the two official guide books, Thames Path in London and Thames Path in the Country, both published by Aurum Press. The books contain Ordnance Survey mapping. The London one is very high scale and includes street names, so is very worth it. First Published: 13 November 2013. Last Updated: 19 August 2015.